Archaeological remains prove the existence of a developed society from as early as the 4th millennium BC. Naxos was an important island in the Aegean already from the 3rd millennium BC becoming an important centre of the Cycladic civilization. Our knowledge of this period depends mainly on the archaeological findings, most of them funeral gifts (in Grota, Kastraki and Panermos). 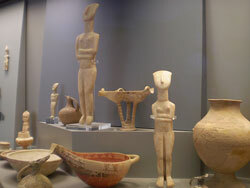 In Naxos have also been unearthed some of the famous Cycladic statuettes. At about this time the people of the Cyclades took to the seas and developed their seafaring skills. They opened up channels of communication and commerce with almost all the various people inhabiting the coasts of the Aegean and the Eastern Mediterranean. 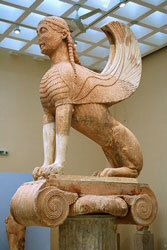 Early in the 2nd millennium BC the civilization of Minoan Crete dominated the Aegean. Then the explosion of the volcano in Santorini occurred (between 1620 and 1500 BC), probably the most powerful eruption mankind has ever witnessed. It is thought to have caused the sudden downfall of the Minoans in Crete and to have allowed the spread of the power of the Mycenaean from mainland Greece. Naxos was used as a port of call in the journey from mainland Greece to the East. Archaeological remains dating to that period (1300 BC) were discovered buried beneath the square of Orthodox Cathedral in Hora (the archaeological site of Grota). In the centuries that followed Naxos was colonized by the Ionians. An important period of the island’s history is the archaic (7th - 6th century BC) when the island prospered: the arts flowered, sculpture and architecture in particular. In 490 B.C., Naxos was attacked and devastated by the Persians who tried to extend their influence seeking control of the Aegean Sea. Naxos never quite recovered, as it did not manage to regain its old splendor. After the final defeat of the Persians by the coalition of the Greeks, Naxos becomes a member of the Athenian Alliance. In 41 B.C. it became a Roman province and was used as a place of exile. The dawn of Christianity (4th century AD) finds Naxos in a state of obscurity. From that date the Christians start building various churches and monasteries, some decorated with high quality frescoes. From the 7th century AD on the Saracens pirates and others struggle against the forces of the Byzantine Empire over the control of the Aegean. The results are disastrous for the economy and culture while all the islands become desolate. The inhabitants of Naxos moved in the inland areas. The Byzantine capital at the centre of the island was built around the Apalirou castle. In 1207, Marco Sanoudo, nephew of the Doge of Venice, captured the island. One after the other the Aegean islands fell. He captured 18 in total and founded the Duchy of the Aegean choosing Naxos as his capital. On the hill, which is the natural defensive point of Hora, Sanoudo built his castle, reusing scattered architectural remains of the ancient city. As soon as Sanoudo captured Naxos, he distributed the land up to his followers setting up a feudalistic system of government. The middle ages were a miserable time for the locals, yet they had to persevere. Deprived of their property, they became serfs, obliged to cultivate the land for the noblemen. The Ottoman Turks took control of the island in 1537 and maintained its feudalistic system of government. Naxos remained under Turkish rule until 1829 when it became part of the newly created, independent Greek state. The end of WW2 ushers in a new period swift change. The ‘50s were catastrophic for Greece’s countryside: immigration caused the population to dwindle, and this was especially the case for the mountain settlements of Naxos. In the ’70s a new period of development begins, partly fuelled by tourism.